"The European Association of Schools of Social Work (EASSW) is a European association of institutions of social work education, organizations supporting social work education and social work educators. Its mission is to promote social justice and develop high quality education, training and knowledge for social work practice, social services, and social welfare policies in Europe. In fulfilling its mission the EASSW adheres to all United Nations' Declarations and Conventions on human rights, recognizing that respect for the inalienable rights of the individual is the foundation of freedom, justice and peace. Members of EASSW are united in their obligation to the continued pursuit of social justice and social development. In carrying out its mission EASSW fosters cooperation, collegiality, and interdependence among its members and with others." 1.1 "Schools" is an inclusive and representative term that refers to universities, colleges, departments, faculties, institutions and programmes that offer post-secondary education/training preparation of professionals in social work, culminating in a degree or diploma signifying successful completion of their studies. Social work is an inclusive and representative title. 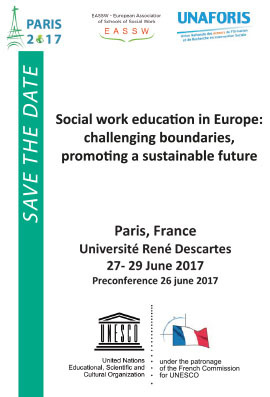 2.1	Provision of a European forum on social work education. 2.2	Advising institutions engaged in social work, through seminars, workshops, special programmes and publications. 2.3	Facilitating the educational exchange of teachers, students and study courses. 2.4	Initiation of study courses, including regional meetings. 2.6	Collection and dissemination of information relevant to social work education and training. 2.7	Initiation and development of social work research. 3.1	The membership of the European Association shall be composed of those engaged in social work education within the Council of Europe membership. Members of EASSW can be outside of the countries listed as members by the Council of Europe, where there are historical and cultural links with Europe. Candidate schools from other continents, where a regional association exists, should be formally notified about such association prior to joining EASSW. 3.2	National Associations of Schools of Social Work. National associations are honorary members. They have an advisory task and will act as non-voting members.? 3.3	Sub regional Associations of Schools of Social Work. Sub regional Associations are honorary members. They have an advisory task and will act as non-voting members. 3.3.1	Sub regional Associations may include national associations with common language of heritage, whose membership crosses continental boundaries. 3.4	Any exception to the standards, mentioned under 3.1, must be agreed by the Executive Committee and reported to the next General Assembly. 3.5	In respect of activities set up by EASSW or which EASSW is invited to, all members are entitled to participate. ?In order to involve as many social work educators in relevant activities as possible, the Executive Committee can open the possibility for participation to other non-member schools, organisations and individuals. 3.6.1	A member may be suspended for a period or expelled for cause such as violation of any of the Constitution or rules of the Association or for conduct pro-juridical to the best interests of the Association. Suspension or expulsion shall be by a two-thirds vote of the membership of the Executive Committee. ?The member will be given notice of the time and place where an opportunity will be provided to present a defence. 3.6.2	Membership ceases with the cessation of the Association as a legal entity. 3.7	Membership of EASSW does not automatically or necessarily imply membership of the IASSW- lt is possible to be a member of EASSW OR IASSW. It is also possible to be a member of EASSW AND IASSW. The functions of the EASSW shall be carried out through the General Assembly and Executive Committee. The General Assembly of the EASSW is open for participation to all members listed in section 3 above. This body receives the chairperson's reports and if necessary reports of other representatives of the Executives Committee. It will review and approve past and present activities and recommend priorities. It will conduct such business as may be recommended by the Executive Committee. 5.1.6	Decide in an appeal against expulsion from membership. 5.1.7 The General Assembly will elect the President, Vice President, Treasurer and the Secretary and the members of the Executive Committee for a period of four years in accordance with Section 4, either at the General Assembly or by postal ballot. Members of the Executive Committee shall be elected for a term of four years, with one half to be elected every two years. Members of the Executive Committee may serve no more then two consecutive terms. Exceptionally, the Executive Committee may give reasons to the General Assembly why a committee member might be able to stand for re-election for an additional period. Not more than one member shall be elected from any country to serve during the same period. Efforts should be made to ensure that different geographical regions be represented on the Executive Committee. The Executive Committee shall serve as the governing body for EASSW and shall be responsible for the development and implementation of the policy of the EASSW and the management of its affairs. 5.2.1.1	The Executive Committee shall consist of a President, a Vice-President, a Secretary, a Treasurer and no more than eleven additional Members. The President, Vice President, Treasurer and Secretary shall be determined by election of those eligible to vote at the General Assembly. 5.2.2	The immediate past-president may serve as a non-voting ex-officio member of the Executive Committee for a period of up to four years. 5.3	Officers of IASSW have the right to participate as non-voting members. Members of ENSACT and the UN offices in Europe will be invited to participate as non-voting members. 5.4	An interest group may be recognized by the Executive Committee when it has the equivalent of 25 members drawn from at least 5 schools which are full members and from at least three countries. A representative can participate in the EC meetings as a non-voting member. This member can advise the EC. 5.5	The EASSW participates in the Board of directors of the IASSW, in conformity with the rules that apply to IASSW. 5.6	National Associations of Schools of Social Work and Sub regional Associations of Schools of Social Work are honorary members and can act as a advisory board to the Executive Committee and to the General Assembly. 6.1	Members of all categories must, to the best of their ability, safeguard the interests of the Association, pay the stipulated dues, and act in accordance with the Constitution and the resolutions of the organization. 6.2	?The President is the official representative of the Association, and according to the constitution of IASSW, a Vice President of the Board of Directors of IASSW. He/she shall preside at meetings of the Executive Committee; shall act as head of the Association in the direction of its business and in the enforcement of the Constitution; shall sign and execute in the name of the Association necessary contracts and other instruments and shall be responsible for their implementation. 6.2.1	In the absence or incapacity of the President, the Vice President or the Secretary shall perform the presidential functions until such time as the Executive Committee appoints an officer to complete the President’s term of office. 6.3	?The Treasurer shall have such duties relating to the funds of the Association as may be specified by the Executive Committee and shall render an annual report to the Committee and to the General Assembly. He/She represents the Association in financial arrangements and shall serve as adviser to the Executive Committee in banking, funding and other fiscal requirements. He/She is responsible for the external Audit of the accounts of the Association each year. 6.4	?The Secretary shall have duties related to the official record of the Association's Executive Committee, General Assembly, Constitution, Letters of incorporation. The Secretary shall have official co-signing authority with the President and the Treasurer for all official documents. The Secretary shall be responsible for the conduct of elections. The Secretary shall be the Registrar, responsible for certifying membership in all of the categories. The secretary shall be responsible for sending out the agenda for the General Assembly no later than 40 days before that meeting. 6.5	? The Executive Committee shall be empowered to act on behalf of the members:?a) to fill in any vacancies in its membership which may occur in the interval between meetings by cooption, subject to ratification at the next General Assembly. ?b) to make provision for an annual audit of the accounts of the Association. ?c) to settle disputes among members of the Association. ?d) to undertake such other action as shall promote the purposes of the Association. ?e) in all its duties the EC is accountable to the General Assembly.? 7.1	The principal offices of the Association shall be in the same locations of the President, Vice President, Treasurer and Secretary, respectively. 7.2	The EASSW will have its own juridical status, according to the articles of association, lodged at the Dutch Court in Maastricht. Dutch law will thereby be enforced on all the international affairs of the Association. The registered office will be Maastricht. 7.3	All EASSW participants will be members of this juridical association and the members will have access to a copy of the articles of this juridical association. 8.1	The General Assembly takes place biennially. 8.2	The Executive Committee shall meet at least annually. Notice of the meeting, signed by the Secretary shall be mailed to members of the Executive Committee at least forty days before the time appointed for the meeting. 8.3	Special Meetings: Special General Assemblies may be called at any time at the request of the President and the majority of the Executive Committee, or 1/3 of the membership. Notice of any special meeting is to be given in the same manner as for the Annual Meeting of the Executive Committee. No business other than that specified in the notice of the meeting shall be transacted at any special meeting of the members. 8.4	A quorum for the transaction of business by the Executive Committee shall be four of its members, including at least the President or the Vice President or the Secretary.? 8.5	A quorum for the transaction of business at a General Assembly or Special Meeting shall consist of twenty percent of the Members.? 8.6	Unless otherwise specified in the Constitution, a simple majority is sufficient in a vote. Membership is maintained by payment of dues in such amounts as may be determined by the Executive Committee.? All dues must be paid annually. Membership is automatically terminated upon non-payment of dues over a period of two years. Members of any category thus terminated may re-apply for membership in the manner prescribed for new members of such category.? 9.2 When an EASSW member wants to become a member of IASSW too, he/she has to pay extra membership dues to IASSW, according to the rules of IASSW. 9.3	Expenditures necessary to conduct the affairs of the Association may be made by the President, Treasurer, Secretary, as approved in the budget. 9.4	The fiscal year of the Association shall be January 1 through to December 31. 9.5	There shall be an external Audit of the accounts of the Association each year, by an Auditor duly appointed by the Executive Committee. 9.6	The Executive Committee shall approve a budget at least every two years, consistent with the policies approved by the General Assembly. 9.7	A Reserve Fund shall be established and protected. The Fund shall accumulate until it equals the amount needed to cover the costs, if the General Assembly votes to discontinue the EASSW office secretariat. 10.1	The Constitution can be amended by a resolution of a majority of 2/3 of the voting members present at the General Assembly or at a special meeting, providing that the item appears on the agenda, or by postal ballot. 10.2	Amendments to the Constitution shall be circulated to the membership and reported and decided by the General Assembly. The dissolution of the EASSW can take place only in a General Assembly convened especially for this purpose and shall require a two-thirds majority of the voting members present. The By-laws were adopted by the Regional meeting in Brighton in 1982. The By-laws were amended by the General Meeting in Montreal in 1984. The By-laws were amended by the General Meeting in Tokyo in 1986. The Constitution was adopted by the General Assembly in Lisbon 1995. The Constitution was amended by the General Assembly in Dublin in 1997. The Constitution was amended by the General Assembly in Helsinki in 1999. The Constitution was amended by postal ballot in July 2002. The Constitution was amended by the General Assembly in Istanbul in 2013. Members of the Election Committee should not be standing for (re)election. There should be at least three members of the Election Committee. Members, who paid the membership fee for the year in which the elections take place, are eligible to vote. One vote per member school and (1/10) one-tenth vote per individual member. Ballot papers for the first round of voting are distributed by the entrance to the General Assembly room. Candidates who are present give a short 2 minute presentation each at the General Assembly. Absent candidates may send an electronic presentation (max 2 minutes) to the Election Committee well in advance of the General Assembly. The EC may consist of up to 15 members. “Members of the Executive Committee shall be elected for a term of four years, with one half to be elected every two years. Votes are collected, counted and announced by the Election Committee. If, in response to the call for candidates, only one person has presented candidacy for each vacant post, there are no competing candidates. If such candidates for office are elected during the 1. round, the General Assembly may confirm their election by a show of hands/ballots. If not all candidates for office are elected in the 1. round, it must be clarified if any of the 15 elected EC members will candidate for the office(s) in question. If so the election procedure can go on and the General Assembly vote in writing on ballots. If it is not possible to find candidates for vacant offices during the General Assembly, the election of the officer(s) must be done by postal elections after the General Assembly, when the new Executive Committee has had time to nominate new candidate(s). The strategic plan for 2016-2020 can be found here.